When you own or rent a flat you have a stake in the building but don't own the bricks and mortar of the whole building. So where does that leave you when it comes to insuring your home? Here we look at how to insure a flat. Who is responsible for insuring my flat? There are two types of insurance to consider when insuring a flat. Buildings insurance and contents insurance. Contents insurance is always your responsibility. Who is responsible for buildings insurance depends on how you own your flat. If you are a leaseholder, then your freeholder should take care of buildings insurance for the whole building. If you jointly own the freehold with other leaseholders, then you are collectively responsible for making sure the whole building is insured. Is buildings insurance a legal requirement for a flat? No. Buildings insurance isn’t required by law, but your mortgage lender may insist a policy is in place. If you are a leaseholder then it may be a condition of your lease that you have buildings insurance, but it is usually arranged by the freeholder. Check your lease to see if buildings insurance is provided. While it may not be set down in law that you have buildings insurance it is a very good idea to have it. A policy covers the cost of repairing damage to your home, or even in the worst-case scenario having it rebuilt. Policies are fairly inexpensive but could protect you from huge financial problems. Do I need buildings insurance for a leasehold flat? If you own a leasehold flat the chances are your freeholder has arranged buildings insurance for the building your flat is in. In this scenario you are probably paying the insurance costs (premiums) via your service charge. It is always worth checking the insurance position when you are leaseholder. Your lease should explain how your property is insured. What does buildings insurance cover in a flat? It should also cover the full cost of rebuilding your home in the worst-case scenario. Find out more about what buildings insurance covers with our dedicated guide to home insurance. What about the rest of the building? Employer’s liability – if you employ security staff, cleaners for communal areas or gardeners, for example. What doesn’t buildings insurance for flats cover? Buildings insurance for flats won’t cover your possessions or anything that isn’t a permanent fixture or fitting inside your home. Fixtures and fittings mean your radiators, baths and kitchen units. Basically, if you turned your house upside down and shook it, everything that would fall out isn’t covered by buildings insurance – hence you need contents insurance too. Before buying a policy make sure you check what isn’t covered. This is usually known as the exclusions and can include things like wear and tear, faulty or poor workman ship and storm damage to fences, hedges and gates. With buildings insurance for flats you should also check whether communal areas are covered, what the rules are regarding unoccupied flats, your liability if someone is injured onsite and if you are covered for liability for employees such as security or cleaners. Find out more about how to get the best home insurance deal. If you are in the process of buying your flat, you are responsible from the point at which you exchange contracts i.e. when you legally own the flat. Make sure you understand the buildings insurance policy situation by then and get contents insurance in place for the day you move in. Most mortgage lenders will insist you already have buildings insurance in place by exchange of contracts. You need to insure your flat, or block, for the amount it would cost to rebuild – not the resale price. This is an important difference as your property’s worth is usually a lot more than what it would cost to rebuild it. The Association of British Insurers (ABI) has a calculator that will help you work out the rebuild value of your individual flat. If you are insuring a block of flats, then you may need to have a professional valuation survey done to get an accurate rebuild value. Once you have a rebuild value it is worth re-assessing it every three years or so to make sure you don’t end up underinsured as rebuild costs rise. Do I need contents insurance for a flat? Contents insurance isn’t a legal requirement, and your mortgage provider is unlikely to insist upon it. But it is a wise purchase. Most of us couldn’t afford to replace all our possessions in the event of a fire, flood or burglary. The contents of the average home are worth £35,000, according to the ABI. When you consider that contents insurance policies can start from just £3 a week, it’s a policy that represents good value for money. If you are renting a flat then buildings insurance is not your responsibility, it falls to your landlord. That’s because buildings insurance covers the structure of the building, fixtures and fittings, central heating and plumbing – all things that are the owner’s responsibility. It is down to you to protect your possessions. That means it is worth arranging a home contents policy. If you are living in a flatshare then you either need to take out a home contents policy with your flatmates or consider tenants insurance. The latter is designed to protect just your possessions, and not everything in the flat. This cover usually insures your stuff whether you keep it in your bedroom or communal spaces. It can also include tenant liability cover which insures you for accidental damage to windows, glass doors and mirrors and the bathroom suite. Will insurance pay for a water leak from an upstairs flat? Water leaks are a common problem in flats. The first thing you need to do is stop the leak and establish what caused it. The plumber who stops it should be able to tell you this. If the leak came from another flat, then the claim needs to be made against their insurance. In a block of flats where the flat owners are leaseholders the buildings insurance should be provided by the freeholder and you will need to make a claim against that for structural damage caused by the leak. The excess on the policy should be shared by all leaseholders through the service charge. Make sure you know who to contact if you need to make a claim against the building’s insurance. It may be the company that is in charge of ground maintenance so check with them and keep the details in a safe place. 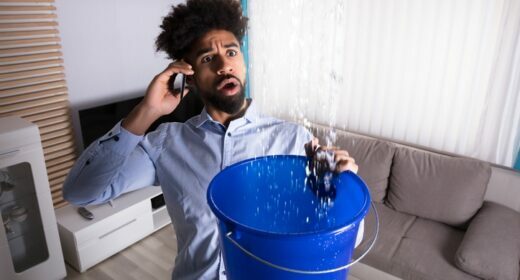 If your belongings were damaged by the leak, then that will mean a separate claim on your own home contents insurance. This should cover your possessions if they have been damaged by water leaks, or flood.